Yahoo is a big company with a much smaller one struggling to get out. A 22.5 percent stake in Alibaba accounts for well over half the U.S. internet group’s roughly $36 billion market capitalization, according to a new Breakingviews calculator. With the Chinese e-commerce giant likely to go public next month, Yahoo Chief Executive Marissa Mayer will find out how investors value the businesses she actually runs. Alibaba is worth around $130 billion before any new money is raised, based on its latest published internal valuation. Assuming Yahoo eventually pays tax at 30 percent on its gain above the small original cost, the post-tax value of its stake is more than $20 billion. Yahoo’s other Asian holding, a 35.5 percent interest in Yahoo Japan, is worth a bit more than $6 billion after tax. Within Yahoo’s enterprise value, after deducting net cash, of around $33 billion, that leaves the company’s own businesses worth a little over $6 billion. And two years into Mayer’s tenure, total revenue is still shrinking, second-quarter financials showed earlier this month. 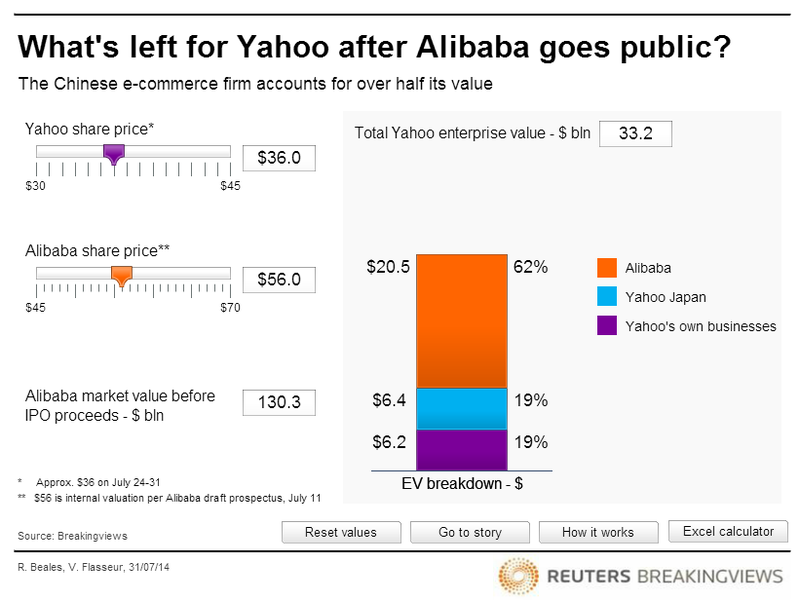 Yahoo recently negotiated downward the maximum number of Alibaba shares it has to sell in the initial public offering. But offloading just over a quarter of its holding will still bring in more than $5 billion after tax, more than doubling Yahoo’s stash of cash and marketable securities. Mayer has managed to get search-related revenue growing again, by 2 percent year-on-year in the second quarter using the standard accounting definition. She needs to maintain that, despite being locked into a stagnant partnership with software giant Microsoft, while also rescuing display ads, where the top line declined 8 percent. Acquisitions offer some hope of growth. For instance, buying internet upstart Tumblr for $1.1 billion last year injected social media credibility, though not obviously much revenue. Mayer has sensibly promised to return at least half the post-tax Alibaba proceeds to shareholders. While rivals like Facebook splash cash on big, risky acquisitions, the Yahoo shambles Mayer inherited and has not yet fully fixed calls for some skepticism. Once Alibaba has its own U.S. listing and investors don’t need to buy Yahoo as a proxy, the value attributed to the search and display businesses will be easier to quantify. That will put Mayer under a narrower, brighter spotlight. Yahoo on July 15 reported second-quarter revenue of $1.1 billion, down 4 percent from a year earlier. As-reported earnings per diluted share at the U.S. internet group declined 15 percent to $0.26 a share in the quarter. The company said it had agreed with Chinese e-commerce operator Alibaba to reduce the maximum number of shares that Yahoo is required to sell in connection with Alibaba’s initial public offering from 208 million shares to 140 million shares. Yahoo currently owns 524 million shares of Alibaba stock, a 22.5 percent stake. Alibaba on July 11 filed a revised draft prospectus for its IPO with the U.S. Securities and Exchange Commission. Share-based awards granted in the first 10 days of July were valued at $56 per restricted stock unit. With 2,328 million ordinary shares outstanding as of March 31, the implied market capitalization of Alibaba is $130.3 billion.